Mapstravaganza comes to an end today. If you have not been following this weekend's binge on all things psephocartographic, you can find parts 1 and 2 on the other end of those links. It is advised that you read those first, as this post may contain some spoilers. 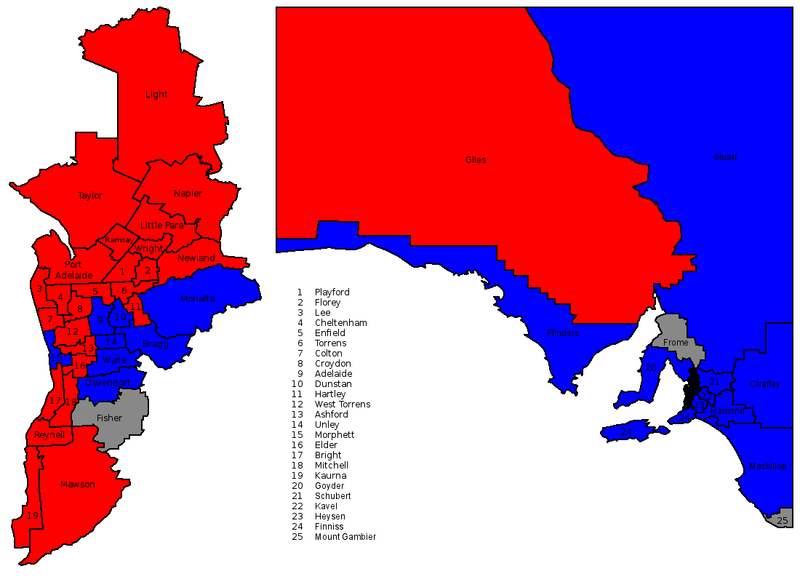 Maps 1, 2 and 6 are similar to those used in the federal election, although some methodological changes (e.g. 1938 cut off) were necessitated by the peculiarities of South Australian electoral history. The equation for map 6 has been modified from 7 layers to 4. Map 5 is useless and will not be dealt with beyond this point. It is a demonstration of VDTA techniques, but has high levels of opacity resulting in a map largely equivalent to an outdated Map 1 (i.e. 2006 incumbency map). This map is inferior to Map 1 and is therefore ignored. Normally I would save these tables for a data dump, but discussing them here means we do not need a data dump at all. 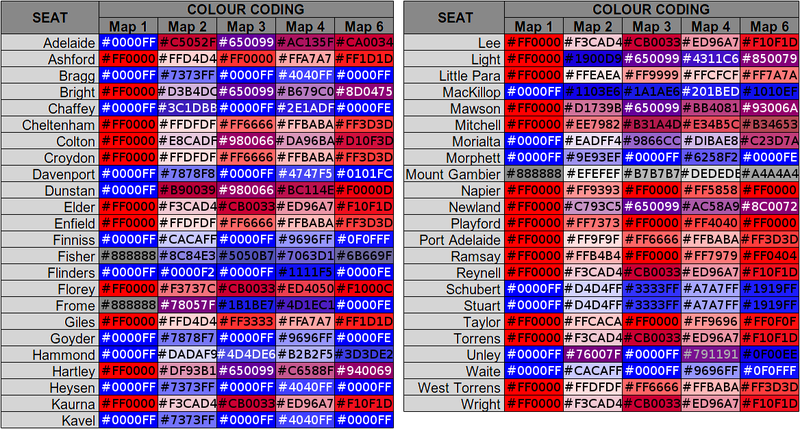 This table includes the colours of all five usable maps (along with their hex-codes for the number crunchers out there). Note that although there have been no green seats won in SA, their is still a green value for many of these colours. I'm going to assume that anyone who knows how to read hexidecimal colour codes also knows that white light is composed of every colour combined, and so this green is obviously leaking through from the white background. This is obviously also true for red and blue, so areas with more background colour (e.g. those seats with a shorter history) get less clear cut results - which is fitting because it means longer histories can provide more confidence in predictions. The hope is that this approach will improve the overall accuracy by combining data. 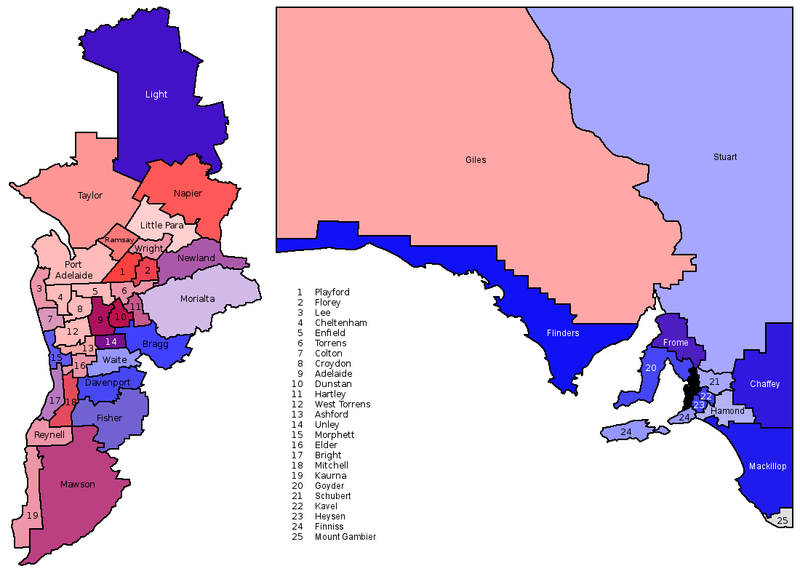 For example, if we assume each map is roughly 80% accurate, seats like Hartley or Morialta can be viewed as examples where one map's inaccuracy is corrected by the other four. By using multiple sources of roughly equal reliability the outliers can be isolated and dealt with; you would have to be really really unlucky to have the majority of the sources defective. A couple of notes: None of these methods, with the possible exception of Map ! (current standings) really allow an Independent's strength to become fully apparent. Mount Gambier is the real outlier here, due entirely to never having been held by a party affiliated candidate. Also, these methods look at trends and history. The idea of a 100% accurate predictive model is ridiculous, but doubly so one based solely on past elections. This post and its prequels completely ignore the specifics of the election campaigns about to unfold, and are perhaps best views as indicators of likely results in a perfectly balanced election. This method reliably suggests Labor holds a slight advantage 25 seats, the Coalition has a head start in 18 and one is reliably called for a conservative independent in Mount Gambier (held by Independents Don Pegler and, before that, Rory McEwan). This leaves Adelaide, Bright and Light as the three others. Aggregate of Maps 1, 2, 3, 4 and 6. For simplicity, all maps are given equal weight. On this balance Labor looks to have an advantage, requiring the Coalition to take two historical seats from Labor as well as gaining the Independent's support. 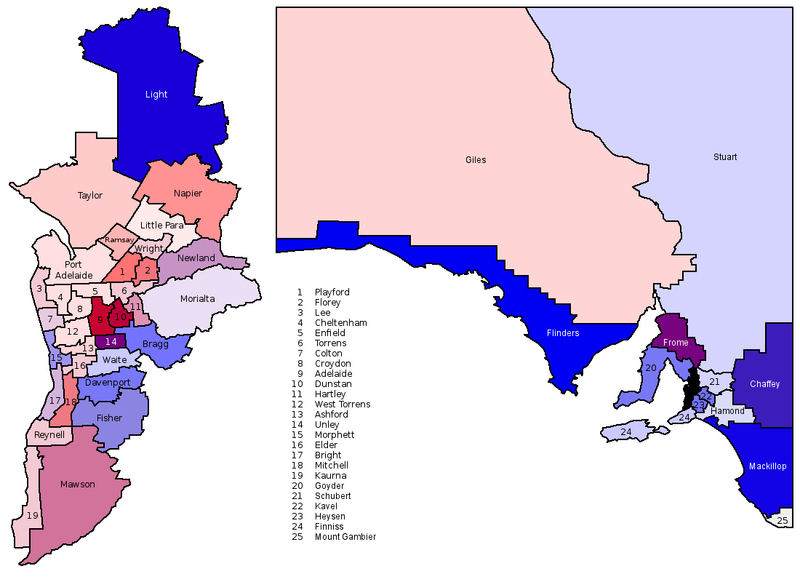 But then there are historical seats and historical seats; taking Mawson would be a lot easier than taking Playford on this data, for example, since the former consistently hovers just on the red side of equal. In reality, this Labor strength is largely the result of the long Labor incumbency. The trends point too a Labor win because that has been the history of this state for more than a decade. Therefore, while there may be a pro-Labor lean in the community at large, the tides may also turn quickly. We will need to consult our other tools before making any confident predictions. Map 6: VDTA adjusted for 50% average opacity across the first 4 layers. Opacity of each layer depends on the reliability of that layer in predicting the following results. 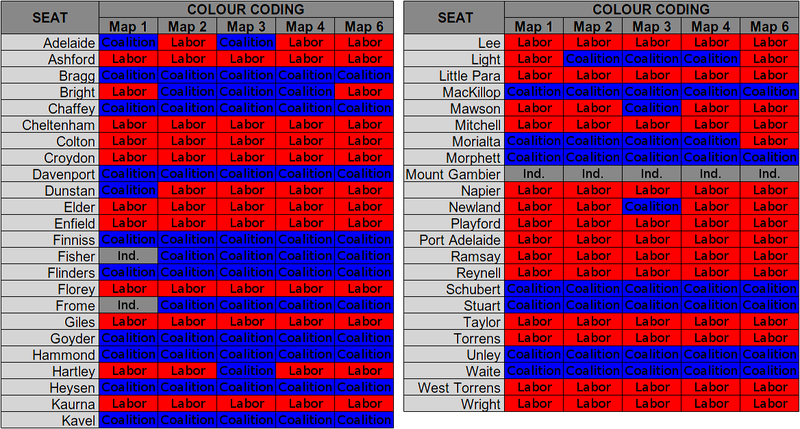 Taking these as being equal in weight (adjustments to old systems and introduction of new methods make comparison of accuracy difficult anyhow), these suggest Labor has a strong history in 25 seats to the Coalition's 18. These trends only reflect historical voting and may differ from the next election depending on campaign-specific events of a general shift in public opinion.